Mr Eastmead was a manufacturer of lifts at Blackfirars, London who was to sell the cars made by T.J. Biggs in Somerset. 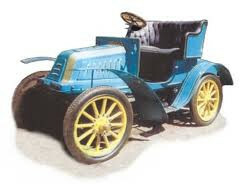 There were only three cars made, the first with a 3.5hp Simms engine which was destroyed by fire. The second had an 8hp Simms engine, French made gearbox and Biggs’ own worm-drive rear axle. The third had an 8hp 2-cylinder Aster engine and the gearbox, rear axle and body were all French made. This car was said to have given good service for several years. In 1905 Biggs designed a car for Raleigh.